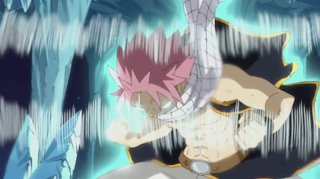 As the fight between Natsu and Jellal continues it doesn’t go well for Natsu, as despite continuing to harass Jellal by destroying parts of the tower, Jellal still over powers him. 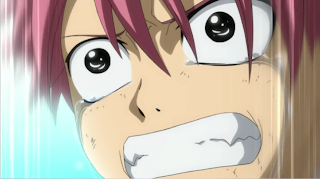 Just as Jellal is about to finish off Natsu, Erza jumps in front of the spell, sacrificing herself to save Natsu, when Simon jumps in front of both of them and takes the full force of Jellal’s spell. Simon has his death scene, made all the sadder by the fact that, as opposed to the manga, he is actually good looking. Nooo!!! Not the pretty boy!! 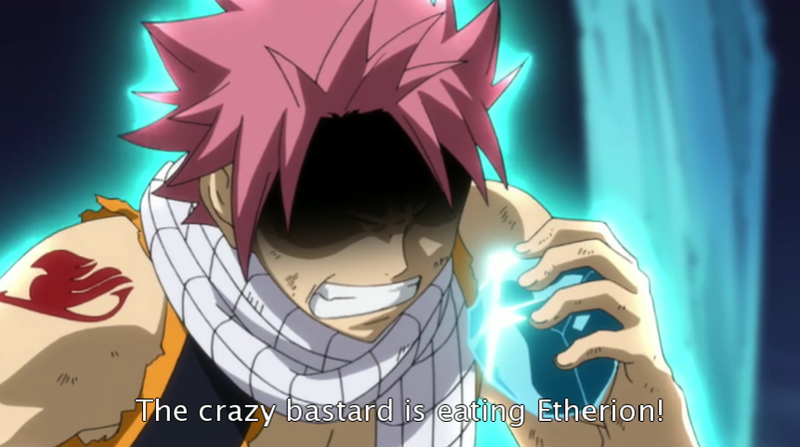 Natsu powers up by eating the lachryma, at first this doesn’t seem to work as Etherion is composed of all elements, not just fire, but for a short period of time Natsu is able to power up to the point that he manages to beat Jellal. The interesting thing about Natsu’s magic is that it is basically described as having an incredible potential, and by being able to power up by eating fire, Natsu is able to over power enemies, despite not being the most power character in the series. I have to admit, this may come off as cheap, but I kind of like it, since it keeps the series from progressing like Dragon Ball Z, where the characters reach insane levels of power. 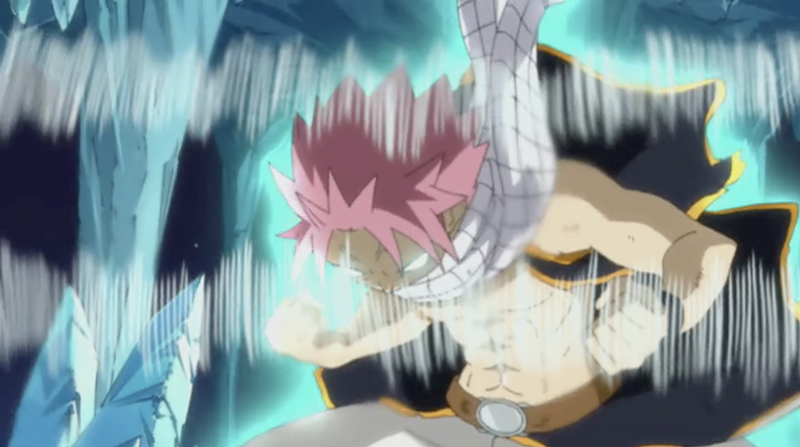 In Fairy Tail we can rest assured that while Natsu is beating powerful characters, he isn’t going to go to Super Saiyan any time soon. After Natsu beats Jellal Etherion starts to go wild, causing the Lachryma to go unstable, and begin to deform to the point where they are about to explode from the unstable energy being stored in them. Erza drags Natsu away, sparing Simon one last glance, before leaving his corpse behind in order to save her still living friend. 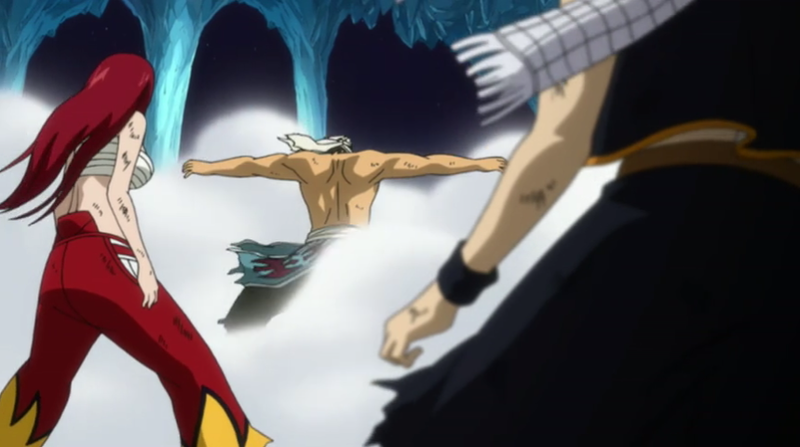 When she realizes that there is no way they can escape the explosion even if they do get clear of the tower, Erza decides to sacrifice herself by fusing with the Lachryma and channeling the energy into her own body, the way Jellal planned to do when he resurrected Zeref. Erza places herself into the Lachryma, despite Natsu’s protests, and everything fades to black. 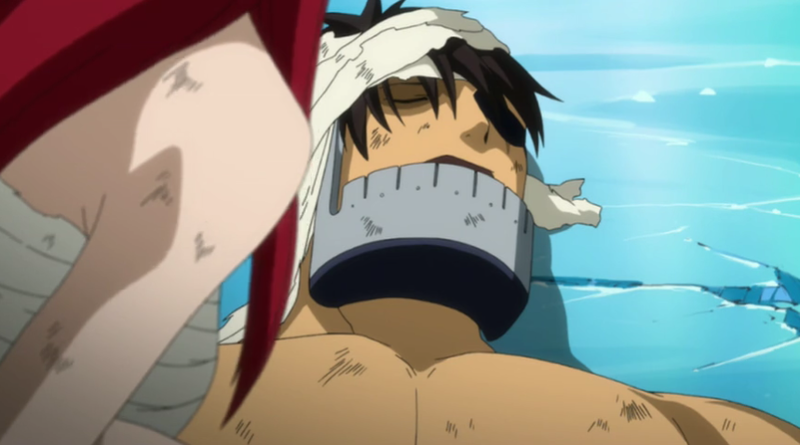 Erza then wakes up floating in some kind of void. 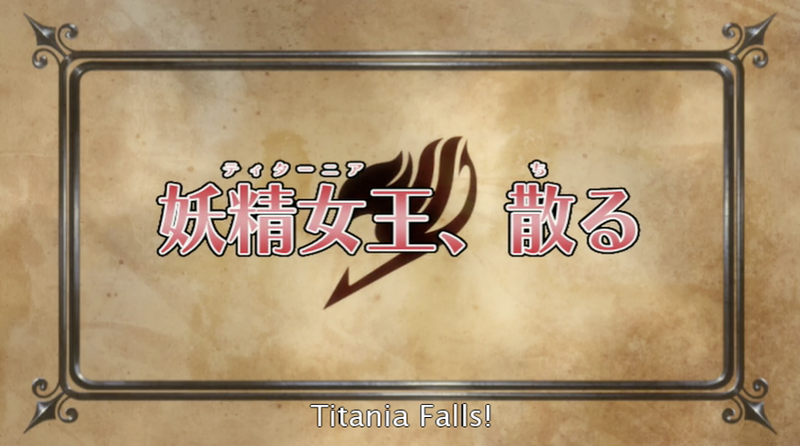 After the ending theme the next episode preview doesn’t say anything about Erza. If I didn’t already know what was going on with the series I would be seriously worried. I don’t feel ashamed admitting, however, that with all the sacrificing self for friends going on, I was tearing up through the latter half of the episode. Like this, but with less pink hair. A fun episode, as the last several have been. This series continues to get better, and I can only hope that it continues to have a long life, but with how close it is to the most recent manga storyline I can’t help but wonder how long this series will keep going, and when we’ll see filler rear its ugly head. Personally I’d rather deal with a few filler arcs, I would even be interested to see if they can keep the quality up, and have the anime continue to be a long lasting one, much like Bleach and One Piece have been, rather than having it end prematurely, or for the ending to be completely filler. For those that are unaware, after this arc there are two more complete arcs, and the manga is coming to the end of a third arc. 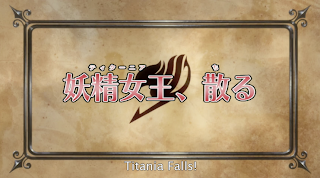 The anime could easily stretch things a little bit, since two of the arcs are on the longish side, or at least as long as Fairy Tail arcs get. At the pace the anime is proceeding I wouldn’t be surprised if they caught up within a few months though. The anime has been for almost a year, and is getting close to catching up to the manga. If Bleach and Naruto are any indications, I think it’s clear that we don’t want the anime placing itself in danger of overtaking the manga chapters. But, at least the anime is going strong, and if the quality is any indication, is doing well. I’ll try to dig up some stats on how the anime is doing rating wise in Japan, which should help us determine how long the show has to go.